On you * Its 8 on my finals day and I’m not even fully awake.. 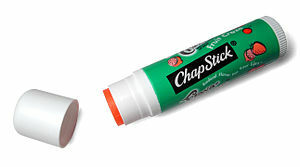 I thought I was the only one with an unreasonable addiction to chapstick (or lipsalve in my case), if I don’t know where it is I panic, I could give up anything, and indeed I have, smoking, prescription meds, but without my lipsalve I’m lost, completly lost. Thank you for posting. “In spite of firmly believing that my life would never get better somehow I allowed myself to admit that I was afraid of things getting better.” Wow… what a powerful statement. I have so been there. But, I also know it’s worth it to hope again. It’s not an easy journey but nothing worth having usually is. Do NOT try to take my Chapstick. I will cut you. Same goes for Kleenex. Oh, sorry. I got a little carried away there. Does it make it worse that I was actually eating sunflower seeds while I read this post? At the L.L. Bean outlet store?